Asian stocks fell after surging to the highest level in almost 10 years, with investors assessing the strength of company earnings before American labor-market data provides the latest clues on the health of global growth. South Korean shares dropped by the most since November, leading the declines, after President Moon Jae-in announced plans to raise taxes on big corporations. Stocks from Japan to Australia retreated, dragging down the MSCI Asia Pacific Index from its highest since December 2007. The greenback held near a two-year low as Federal Reserve speakers expressed caution over further interest-rate increases. The euro, the best-performing Group-of-10 currency this year, maintained most of its surge against the dollar and the 10-year Treasury yield was at 2.26 percent. Investors are also weighing a report that U.S. President Donald Trump’s administration is preparing to investigate China over what the administration perceives to be violations of intellectual property, a move that would not only impact trade ties between the world’s two biggest economies, but could have negative ramifications for the global economy. Corporate results are dominating sentiment this week, while Friday’s report on the U.S. employment market may provide the next inflection point, as investors look for clues on the strength of the world’s largest economy and the Federal Reserve’s next policy move. Bank of England Governor Mark Carney may signal a more hawkish tone at its quarterly Inflation Report on Thursday. The central bank will likely keep rates on hold. U.S. jobs data on Friday will probably show employers added about 180,000 workers in July. 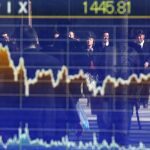 The Kospi index fell as much as 2.2 percent, the most since Nov. 9, the day after the U.S. election, and was trading 1.7 percent lower in a test to a rally that propelled the benchmark to a record high last month. Samsung Electronics Co., which has the largest weighting on the index, dropped as much as 3.8 percent. The government unveiled plans to raise taxes on big corporations and high-earning individuals Wednesday as Moon has vowed to tackle inequality. Japan’s Topix index dropped 0.1 percent as of 2:25 p.m. in Tokyo. 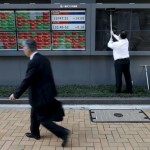 Australia’s S&P/ASX 200 Index lost 0.2 percent as Rio Tinto shares tracked their London stock lower. 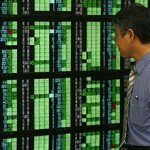 Hong Kong’s Hang Seng Index was down 0.2 percent and the Shanghai Composite Index also fell 0.3 percent. Futures on the S&P 500 Index lost 0.1 percent. The underlying gauge added 0.1 percent and the Dow Jones Industrial Average rose 0.2 percent on Wednesday to break through 22,000. Tesla Inc. shares were up more than 7 percent in after-hours trading after the company burnt through less cash than expected in the second quarter. 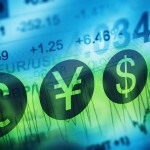 The yen was little changed against the dollar at 110.66. The Bloomberg Dollar Spot Index added 0.1 percent after slipping 0.1 percent on Wednesday. The euro fell less than 0.1 percent to $1.1851 after climbing 0.5 percent in the previous session. The yield on 10-year Treasuries slipped one basis point to 2.26 percent. 10-year yields in Australia fell to 2.67 percent. West Texas Intermediate crude slipped 0.4 percent to $49.40 per barrel. It rose 0.9 percent on Wednesday. Record demand for gasoline helped ease concerns that increasing crude production from America’s shale fields will worsen a global glut.